U.S. Representative Kathleen Rice today hosted a visit by the recently appointed director of the Federal Emergency Management Agency’s (FEMA) National Flood Insurance Program (NFIP), Deputy Associate Administrator for Insurance and Mitigation Roy E. Wright. Garden City, NY - August 24, 2015 - U.S. Representative Kathleen Rice today hosted a visit by the recently appointed director of the Federal Emergency Management Agency’s (FEMA) National Flood Insurance Program (NFIP), Deputy Associate Administrator for Insurance and Mitigation Roy E. Wright. Rep. Rice and Mr. Wright met this morning with New York State Assemblyman Todd Kaminsky, Nassau County Legislator Denise Ford, and other local officials to discuss recovery efforts on Long Island, the FEMA claims review process, and ongoing efforts to reform NFIP amid widespread allegations that many homeowners’ insurance claims may have been underpaid in the aftermath of superstorm Sandy. Rice and Wright later visited the homes of two Sandy survivors to discuss the challenges they’ve faced collecting insurance money and rebuilding their homes, after which Rice and Wright joined state and local officials for a press availability on the Long Beach boardwalk. “Leaving behind Washington and coming right to the heart of where superstorm Sandy most impacted our neighbors is exactly the type of aggressive, muscular government we deserve but so seldom receive. I appreciate Mr. Wright’s willingness to see for himself what we are going through. Thank you also to Congresswoman Rice for hosting this visit and joining us on the front lines of recovery,” said Assemblyman Todd Kaminsky. “On behalf of residents impacted by Sandy, our heartfelt thanks to Representative Rice for taking initiative in working with NFIP and FEMA to overcome mistakes of the past and initiate changes necessary in case of another disaster,” said Nassau County Legislator Denise Ford. "We are extremely pleased that Mr. Wright joined us here in Long Beach to meet with residents who have struggled to return home after Sandy," said City Council President Len Torres. "This City Council will continue working with all levels of government, fighting to ensure that our residents receive the resources they desperately need and deserve to rebuild stronger, smarter, and safer. We also encourage residents to explore reopening their claims in advance of the September 15 deadline. For those in Long Beach, we have our Residential Rebuilding Assistance Program where a caseworker can assist folks with filling out forms and navigating through their rebuilding efforts; if anyone in Long Beach would like help, please contact one of our caseworkers at 516-705-7222." 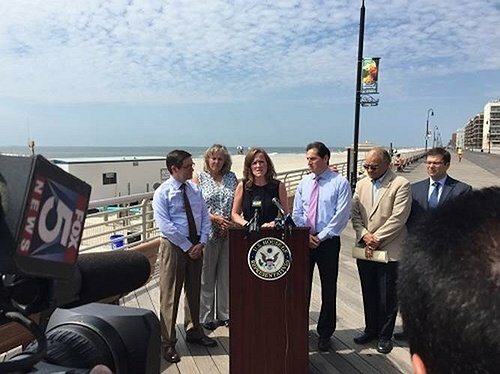 Subject: LongIsland.com - Your Name sent you Article details of "Rep. Rice & FEMA’s NFIP Director Roy Wright Meet with Local Officials & LI Sandy Survivors"